Budgeting is basically related to how you plan for all the upcoming expenditures and income to save money and know what can you really afford. You need to work on your personal budgets so that you may know how much to spend routinely and within your means. It is important to know all your bills, income, expenses, funds and everything before you start on planning a good personal monthly budget. If you think that your total salary is what you need to spend, you easily overestimate the whole thing and land nowhere. Subtract all your security taxes and what you take home is main pay that should be used. Personal budget worksheet consists of four sections in total that are; category, monthly budget amount, monthly actual amount and the difference. The heading category is where you find all types of incomes, bonuses and areas where you are required to spend. It includes your income amount that you take home, loans and debts that might be for rent, credit card, home equality loan, student loan etc, saving and investments section to enter the amount of money that you have planned to save for future or so. Furthermore, it also includes all types of household expenses columns that are utilities, food, family obligations, home, health and medical, transportation, other payments, entertainment, clothing, miscellaneous and much more to get you started with your daily spending sketches. All you need to do is fill in the information that is required and enjoy the budget you will have in the end. 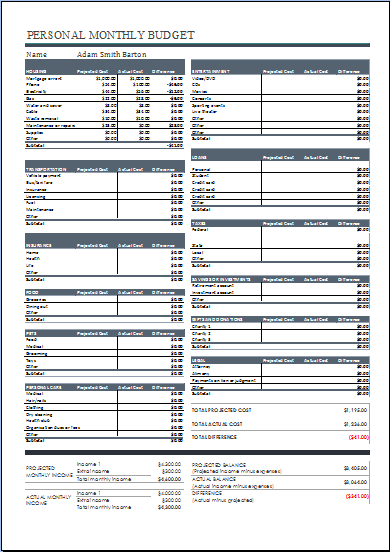 Personal budget worksheet is a comprehensive MS Excel sheet that contains all income and expense details for any individual. One can keep track of his/her personal expenses. All expense details are categorized with small sub-categories format. Expense categories are detailed as home, daily living, entertainment, transportation, vacations, health, different subscriptions, recreation, personal financial obligations and any other miscellaneous payments. For user facilitation each of these categories has detailed sub-categories given. For example Home category has sub-categories such as mortgage/rent, utilities, home and cellular phones, repairing or renovation, fixing and improvement, kitchen, security and garden supplies etc. 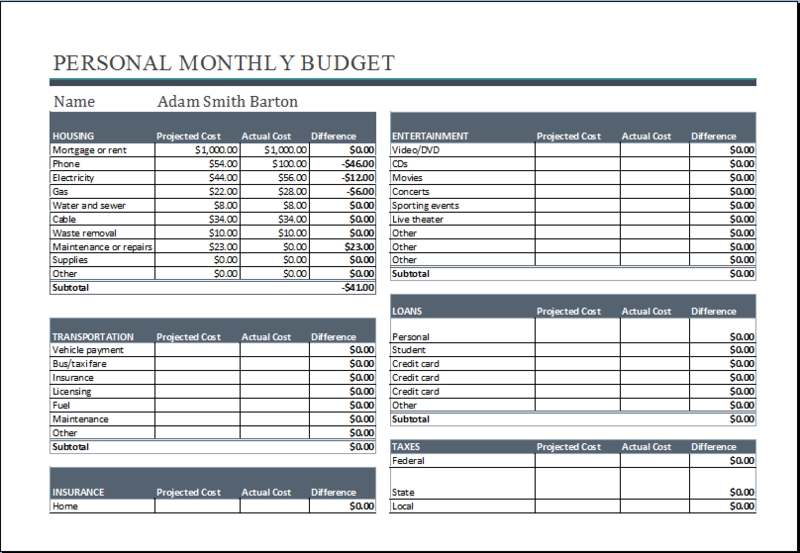 You will have very good experience of using this personal budget worksheet template. Stay mentally free and you don’t have to remember anything by your own as this worksheet contains every bit of details.